This is a portable ECG recorder that is worn by the patient for a specified period of time, usually 24 or 48 hours. The purpose of this is to evaluate how fast or slow the heart beats while the patient is involved in various activities as well as sleeping. It can also be used to check for abnormal patterns of heart rate, known as arrhythmias. 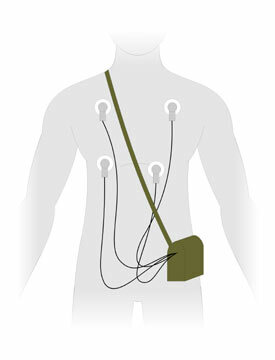 The Holter Monitor records all of the electrical activity of the heart during the time of the test. Usually, the Holter Monitor test is performed at home. The patient will be fitted with a Holter Monitor at a medical center and be instructed in its use. The electrodes are placed on the patient’s chest by a technician, who will also cleanse and possibly shave the points of attachment to ensure a good level of contact. The box may be clipped to the patient’s belt or waistband, or it may be worn around the neck on a strap. The monitor is worn at all times during the study. However, it must not become wet, so bathing and showering must be postponed until after the test period has ended. Using a Holter Monitor is noninvasive and causes no pain, other than possible slight irritation where the electrodes are placed. The patient (or parent or guardian) will be asked to keep a record of activities during the test period as well as any symptoms such as chest pain or dizziness so that the technician will be able to correlate heart activity data with behavior and prepare a report for the cardiologist.